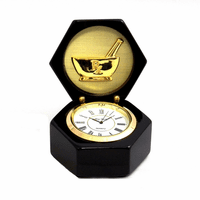 FEATURES/SPECS This thirty minute sand timer for doctors and nurses is a truly one of a kind gift to surprise your favorite medical professional with. The timer is made of polished brass and clear glass and contains exactly a half hour's worth of sand. Its mounted between two brass columns on a genuine marble base. The green marble is polished to a shine and has beveled edging. 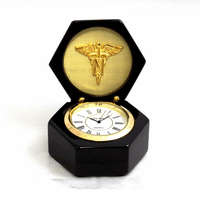 In the center of the base is a brass Caduceus emblem, the symbol of the medical industry. 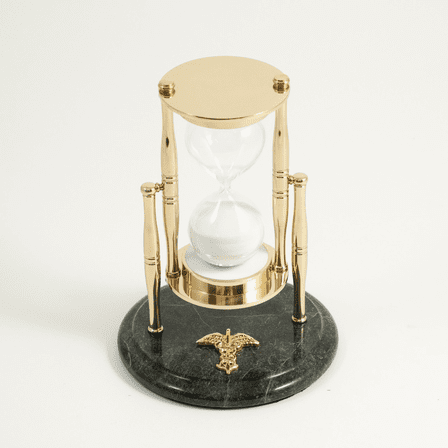 This thirty minute hourglass will look great on a shelf in a medical center or on your doctor's or nurses desk. It comes packaged in a gift box, ready to be presented. Yes, we could add a brass plate for you. Just let us know in the comments section of our checkout page what you would like engraved on the plate. Be sure to mention that you would like the plate attached to the top of the timer.